The requirements of high-tech industry and the cultural diversity of our global company provide for an attractive and stimulating working environment. We therefore look for employees who do not only have the required technical skills but also have extensive soft skills and are able to work in and with international project teams. For this reason, we place great importance on staff development and a continuous exchange of knowledge. Various education and training programs provide technical know-how and enhance basic skills. Thus, the personal development of each employee is promoted systematically. 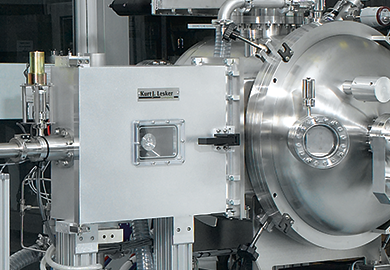 Our competencies	Oerlikon Leybold Vacuum offers a wide range of advanced vacuum solutions for use in manufacturing and analytical processes, as well as for research purposes. The company's core capabilities centre on the development of application and customer specific systems for the creation of vacuum and extraction of process gases. Oerlikon Leybold Vacuum's ability to meet highest requirements of most complex applications gives our customers the competitve edge to succeed. High duty processes in metallurgy, clean-room conditions at worldwide renowned institutes for research and development, or coating applications of minute dimensions – Oerlikon Leybold Vacuum offers highest performance. Pfeiffer Vacuum – a name that stands for innovative solutions, high technology and dependable products, along with first-class service. Vacuum technology can be found everywhere in our daily life – often without us being aware of it. Thanks to vacuum technology, using our mobile phone or wearing glasses to see better is natural to us. Even our groceries would not have the same high quality level without vacuum technology. Pfeiffer Vacuum offers comprehensive solutions that are vital for the production of these and many other products of our daily life. Thanks to our know-how, we continue to be the technology and world market leader in this field. To no small degree, this also manifests itself in our strong profitability. As a leading global provider of high-quality vacuum products and systems, along with an established tradition of service and attention to detail, the Kurt J. Lesker Company® (KJLC®) has built a reputation for “Enabling Technology for a Better World”. Drawing from our comprehensive list of products and services, KJLC has long believed and behaved in ways that demonstrate industry-standard-setting responsibility and responsiveness to its customers. Every phone call is answered by an actual person. Every product issue gets immediate and complete attention until it is resolved. Experienced employees continually make themselves available to those seeking information and guidance. KJLC sees every customer interaction as an opportunity to deepen valued relationships. Founded in 1954, KJLC has grown from a regional manufacturer and distributor of vacuum components into today's worldwide marketplace, offering a full range of vacuum parts, products, systems, design technologies, innovative thinking, and responsive customer service. Working with an attentive eye toward quality, environmental stewardship of resources, and customer satisfaction, KJLC serves the research and development market at both the academic and commercial levels, as well as providing vacuum products and services to industry on a global scale. Following our successful expansions into Europe and Asia, KJLC continues to reach out for a greater global presence with the newest location in Hong Kong. hnology and electron optics, invented the first set of turbo molecular pump, commercial helium leak detector and scanning electron microscope in China. KYKY has been dedicated to providing comprehensive vacuum solutions to the partners all over the world in the past 50 years. Researched and produced the vacuum products in the field of vacuum pump, vacuum leak detector, vacuum measurement and vacuum system, KYKY is becoming the global competitive vacuum system manufacturer, playing a more and more important role in scientific research, aerospace, solar cell, coating, lighting, semi conductor, etc.